Dr. Charlotte K. Frank is Senior Advisor, Research and Development for McGraw-Hill Education. She joined the company in 1988 from a nine-year leadership role as Executive Director of the Division of Curriculum and Instruction for the New York City Public Schools where she was also a mathematics teacher and supervisor. Dr. Frank has been the keynote speaker at major forums (e.g., Teachers College, Harvard University, NYU, Hunter College, and Bank Street College) with a focus on comparing and contrasting school practices with the needs of the workforce for the twenty-first century. 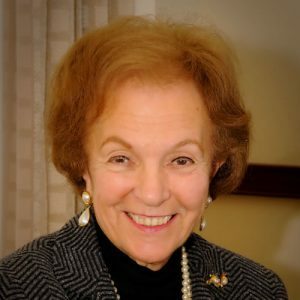 She provides leadership for the Annual Harold W. McGraw Jr. Prize for Those Who Have Made A Difference in Education as well as serving as the co-chair with Peter Yarrow (Peter, Paul & Mary), “Operation Respect: Don’t Laugh At Me”. Dr. Frank has received more than 70 awards for her achievements in education. In April, 2013 she received the NYU-Distinguished Alumna Award. In April 2012, Dr. Frank was given a “salute” by The Bank Street College of Education. In June, Education Update awarded Dr. Frank “An Outstanding Educator of the Year, 2012 Award. During 2011, recognition was given by Mercy College, The National Principal’s Leadership Institute (NPLI), and on December 1, 2011, she was inducted into the Association of Educational Publishers (AEP) Hall of Fame. Dr. Frank is a recipient of the Hunter College Hall of Fame, which is in addition to Hunter’s Professional Achievement Award, and has been honored to be a Townsend Harris Medalist from the Alumni of the College of the City of New York. Dr. Frank graduated with a B.B.A. from CCNY, an MS.ED. from Hunter College, received her Ph.D. from New York University and is now a N.Y.S. Regent Emerita.